Richard Lewis Roth (b.1927), painter, now in his 89th year, hasn’t produced new work recently, but actively contemplates and enjoys his accomplished work. He wants to share his pleasure with you in the present show. He started painting seriously in his 30’s, around 1962, and went through several interesting phases. In 1974 he was doing a series of paintings that loosely involved stripes. In one painting he determined to make a stripe effect by spontaneously drawing parallel strings of abstract linear shapes. The intended stripe effect suggested interesting individual shapes. They had a calligraphic quality like writing of an exotic language. Besides painting, Richard is interested in the study of language. He had the idea of associating the two interests by assigning sound values to the various shapes and in creating more shapes in their spirit. They became a kind of alphabet. 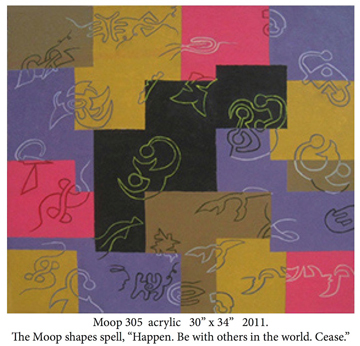 It took several paintings in the same style before the “alphabet” had matured enough for him to make sentences that generated Moop shapes across the canvas in interesting and playful ways. There are almost 200 shapes now organized into three “alphabet” styles. But there are only 21 “sound categories.” Therefore each sound category has a number of different interchangeable shapes. For example the “s” sound category, so far, has ten different shapes. A short statement with the common “s” sound appearing ten times could have each instance look different. With some freely executed exceptions, the Moop paintings spell out brief thoughts. But the shapes are not legible without a key. They are not supposed to be read. It is just a device to produce a rich sequence of shapes to be enjoyed for their own artistic effect. When exhibited the captions state the words but just for anecdotal interest. This show includes a newer set of works with a strong color background, grid organized. And it features sketches of all the Moop shapes to encourage viewers to look more into the paintings and enjoy the play of the shapes with each other and with the whole painting.